Regulation of the ERK1/2 cascade is one of the most studied functions of arrestins and illustrates many of the features that enable them to function as GPCR-regulated scaffolds. 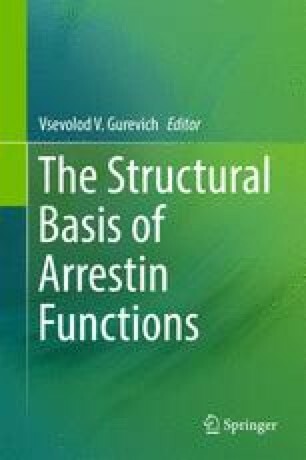 While all four arrestins can bind the component kinases of the ERK cascade; c-Raf1, MEK1/2 and ERK1/2, their binding is dependent on arrestin conformation, such that inactive ERK1/2 can be sequestered by a microtubule-bound pool of arrestin, while activated ERK1/2 binds with high affinity only to the GPCR-bound arrestin conformation. The result is both a dampening of basal pathway activity, and the arrestin-dependent activation of a spatially and temporally constrained pool of ERK1/2 that differs in function from ERK1/2 activated by G protein-dependent mechanisms or classical receptor tyrosine kinase growth factor receptors. Arrestin-bound ERK1/2 performs numerous functions in cells, among them contributing to the regulation of GPCR internalization and trafficking, control of cell proliferation and non-proliferative cell growth, and regulation of cytoskeletal dynamics involved in cell migration and chemotaxis. The finding that arrestin binding of c-Raf1 and MEK1/2 can be disrupted by point mutations that eliminate its ability to activate ERK1/2 without disrupting its other functions indicates that the two major functions of arrestins, GPCR desensitization and signaling, are dissociable, and offers tools to probe arrestin’s diverse cellular functions. Supported by National Institutes of Health Grants R01 DK055524 (LML), R01 GM095497 (LML), Department of Veterans Affairs Merit Review Grant I01 BX003188 (LML), and the Research Service of the Charleston, SC Veterans Affairs Medical Center. The contents of this article do not represent the views of the Department of Veterans Affairs or the United States Government.